Who will decide what the allowed opinions are? Censorship in Europe is an increasing threat against basic human rights and eventually against rule of law. They also reported about the proposed “common sense voices”, a task force to provide countermeasures when radical messages are spread in social media. Already in 2011, Rick Falkvinge highlighted the risk of opening the door for censorship, even it it is for a good cause. It now appears that he has been proven right. Wer in Syrien wirklich kämpft: Die schwarze Liste der Schande des Westens (in German) / Who actually fights in Syria: the black list of the Empire’s shame (translation to English). Obviously, state criminals in the West don’t want the public to know about their crimes, and will do anything to stop such information from getting attention. If it is not enough to label critical voices as “conspiracy theorists” or “Putin lovers”, censorship seems to be a possible method. This entry was posted in Uncategorized on 2017-01-30 by Webmaster. Eleven years have passed since Daniele Ganser published his to journalism processed dissertation on Nato’s power structures in Western Europe of the Cold War: That included Sweden. Nato guided and supervised under two models: partly through the stay-behind systems, a parallel invisible paramilitary apparatus of power ready to fight attempts to invade from the Soviet Union, partly through controlled terror actions, “the fear strategy”, directed toward the political left, especially the large Communist parties of that time in Italy and France. In these operations, the security service allied itself with right-wing extremists. Ganser credibly shows Nato’s and CIA’s power over the Western European security systems. However, he is too conspiratorial in the description of terrorism links to the US and British security services. He simply lacks reliable sources to base his analyzes on and the notes are woefully thin. Ganser also recognizes that he mainly relies on secondary sources or newspaper. The criticism against him has been massive from the majority of the scientific community. Ganser speculates to the limit of parody. Olof Palme should – actually – have been murdered because of his Nato-resistance and it is hinted that the murderers came from the West’s security service. He more than suggests that George Bush himself launched the September 11 massacre, in order to combat any kind of terrorism without restrictions. Aldo Moro, the Italian prime minister, was allegedly murdered by a conspiracy between Western security services and the Red Brigades. When I read the sections, to which I have devoted much of my time, like Italy and France, I discover many errors. The question you ultimately ask yourself becomes: Why is this broken-criticized and decade old book published, right now? At a time when the entire global security system has been rewritten and the center of war and terror moved from Europe to the Middle East and when we learned immeasurably by Assange and Snowden of espionage, surveillance, terror and power politics. I used to think that the mass media’s duty was to critically examine the rulers and authorities. That is the way I still think they should work, which is essential for a functioning democracy. However, Aftonbladet’s review of Daniele Ganser’s book on NATO, is a perfect example of how today’s mass media often take another role: To protect the rulers and authorities, even from well-founded suspicions of state crime. Aftonbladet’s reviewer, Olle Svenning, does a highly professional job in smearing Ganser, a bit like a professional executioner who prepares the gallows for a dissident. Personally, I’m not even sure if Svenning has read the entire book, if he really believes what he wrote or if he has any facts to support it. But I believe that does not really matter to Svenning’s superiors, because Svenning must have delivered exactly what they expected. This book is absolute dynamite and it is natural that very influential powers want to discredit it. 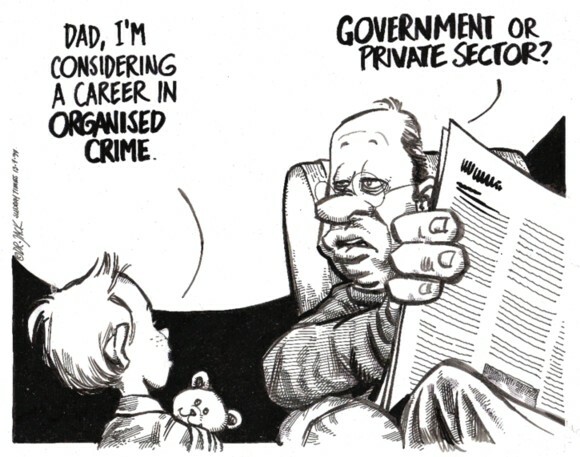 If the book was used as a starting point for further investigations and prosecutions, ordinary citizens might find out the truth about serious criminality with links to the highest places, the real perpetrators might be caught and the prospects of a revived democracy with a real justice system and less terror would be much better. I’m sad to see that Aftonbladet has taken the position they did, without even stating which facts the conclusions are based on. I have written to Aftonbladet asking about the many alleged errors concerning Italy and France, but have received no reply so far. Thus, Svenning calls Ganser’s 50 pages of notes “thin”, but does not seem able or willing to provide a single comment to support his own claims about errors. Also, Svenning does not mention with one word that Ganser has a Swedish historian, Mats Deland, as co-author for some of the chapters. In my opinion, we should be thankful to Ganser and Deland for the excellent work they have done, despite the difficulties they must have faced and the possible shortcomings of the book. For example, some chapters are extremely short (only one page), although there is probably much more to tell. Because of the origin of the main author, Ganser, I would have like to read more especially about Switzerland. Regarding Svenning’s final question, the book can actually be essential for starting to understand how hidden state crime might be taking place also today, although the perpetrators seem to be independent extremist groups. It is, in my opinion, likely that Muslim extremists have since a number of years taken the place of left extremists, to blame even if a state is behind the terror. To just slightly modify the pattern of the old crimes and still get away with it is of course easy if you have mass media on your side. This entry was posted in Uncategorized on 2017-01-28 by Webmaster. The Jewish Press writes about former Israeli minister Tzipi Livni, who cancelled her planned trip to Belgium after a Belgian court ordered the arrest of her. Earlier, the UK has given her diplomatic immunity. It is striking how easy it is for some alleged criminals to avoid prosecution, while others are treated in a totally different manner. This entry was posted in Uncategorized on 2017-01-25 by Webmaster. The former newspaper editor Udo Ulfkotte, who exposed CIA, has been found dead at an age of only 56. The underreporting of his book Bought Journalists, for example in Sweden, is a telling illustration of how most of today’s mainstream media work: To ignore, ridicule or exclude those who try to try to report some of the most inconvenient truths of our time. From history, such as World War II, we learned the importance of air supremacy. One definition of it is the “degree of air superiority wherein the opposing air force is incapable of effective interference.” Now we must realize the analog concept of media supremacy and the importance of it. Obviously, the USA holds the media supremacy in many countries, which is key to enable them to do what they want. Ulfkotte still had the courage to speak out. His book became a bestseller. In case you doubt what he wrote, listen to the CIA’s secret propaganda war in Sweden, a documentary by Swedish Radio (in Swedish). When a long time has passed, mainstream media seem more capable to report about such sensitive issues. If the CIA was doing this in the 1950s and 1960s, do you think they have stopped or have developed it further? This entry was posted in Uncategorized on 2017-01-16 by Webmaster. Yesterday would have been the 29th birthday for Giulio Regeni, if he had not been tortured and killed at the end of January or beginning of February 2016. We still remember you, Giulio Regeni. When will the suspicions against Egyptian authorities be fully investigated? We still demand justice for Giulio Regeni, but not only for him. Read more about the recent tweet from his mother (in Italian). 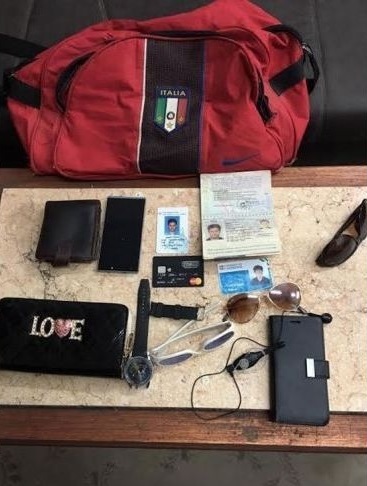 The photo shows objects claimed to have been found 24 March 2016 by the Egyptian police (including documents of Giulio Regeni). Photo source: Wikimedia Commons. Since the beginning of January, Sweden is part of the UN Security Council for two years. Read the critical article in The Indicter: How Sweden bribed its way to a seat in the UN Security Council using millions taken from the public budget for aid to poor countries. Another critical voice has also been heard on Swedish Radio (in Swedish). This entry was posted in Uncategorized on 2017-01-14 by Webmaster. Since the 1 January 2017, Germany has changed their law, which previously clearly outlawed even preparing war of aggression. Read more and consider signing the open petition (both in German). As a member of the Bundeswehr, I am committed to maintaining peace. And the abolition of § 80 from the Criminal Code is a considerable threat to peace and, in my view, is a preparation to endanger peace in the near future. However, already before this change, the old law didn’t stop Germany from participating in wars of aggression. This entry was posted in Uncategorized on 2017-01-08 by Webmaster.